Deutsche Post's Streetscooter was built without big engineering costs. FRANKFURT -- German logistics giant Deutsche Post has designed and built its own electric delivery van, exploiting sweeping changes in manufacturing technology which could upend the established order in the auto industry. 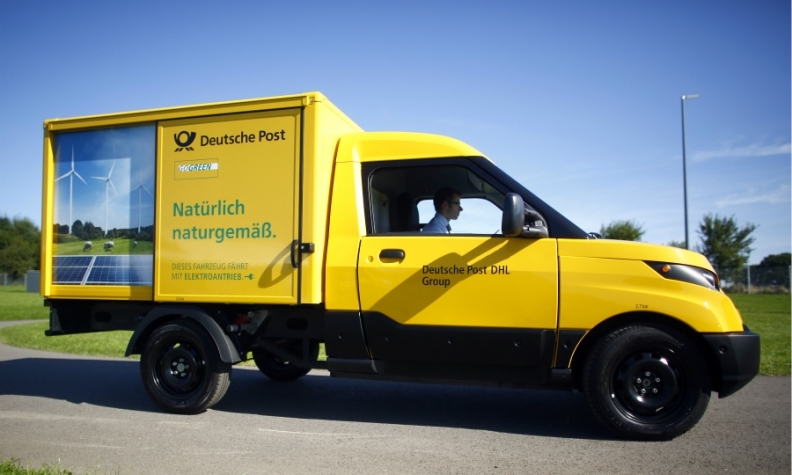 For the moment, Deutsche Post is using the vehicles itself to meet growing demand for e-commerce deliveries without adding to air pollution in German cities, replacing conventional Volkswagen vans. But having decided to go it alone with the project - upsetting VW "beyond measure" - the group will soon decide whether to start selling the Streetscooter model and join those set to compete directly with established automakers. Advances in manufacturing software are allowing the likes of Deutsche Post, Google and start-ups to tap suppliers to design, engineer and test new vehicle concepts without hiring thousands of engineering staff or investing billions in tooling and factories. Technical and engineering know-how among this network of suppliers has blossomed since traditional manufacturers began farming out research and development to keep their own costs down after the global financial crisis of 2008-09. Today, suppliers produce components which make up 80 percent of a car, up from about 56 percent in the 1980s, creating a manufacturing system which is being used by new entrants such as Google for its driverless cars. Deutsche Post says it took this route when the conventional vehicle makers turned down requests to build the electric vans in what are limited numbers by their standards. But Volkswagen, whose Caddy vans are being phased out by Deutsche Post in favor of Streetscooters, is among the established carmakers unamused by missing out on the project. "I am annoyed beyond measure. I, of course, ask myself why Post did not talk to our VW Commercial vehicles division about doing something similar," CEO Matthias Mueller said. "Let's see if we can still get a foot in the door there." Deutsche Post already has 1,000 of the bright yellow vans on the road, and production has been raised to 5,000 vehicles a year, with the possibility of adding a second shift. "We are purposely not reinventing the wheel. We do not produce a single component ourselves. Everything comes from a supplier," Win Neidlinger, director of business development at Deutsche Post's carmaking arm Streetscooter GmbH, told Reuters. Streetscooter used a software program made by PTC to talk to a network of 80 suppliers including Bosch, which provides the electric drivetrain, and Hella which makes the headlights. PTC's Windchill software, which costs 300 to 1,000 euros ($330-$1,120) per user per year, is used by 90 percent of the top 50 automotive companies including Continental, ZF, Volkswagen, Audi, MAN, Hyundai and Ferrari. Dominik Ruechardt, business development director at PTC, said software systems are becoming more accessible. After years of spending millions to customize in-house development programs, carmakers have begun switching to more standard systems, helping to expand the network of suppliers. "There is a clear trend to go to out-of-the-box systems. Five years ago the auto industry launched a code of conduct for product lifecycle management. We have a common understanding of an open architecture, interfaces, support of standards," he said. With e-commerce orders rising, Deutsche Post knew increasing inner city delivery trips would mean more pollution unless it switched to zero-emission vehicles. "We scanned the market. There was no electric van available so we decided to build our own," Deutsche Post board member Juergen Gerdes told Reuters. Electric vehicles - which are far simpler in design than combustion-engined cars - require only a tenth of the staff during assembly, dramatically lowering production costs. "We designed it as a tool. So the fit and finish does not need to be as good as in a passenger car," Neidlinger said. The vans are designed to last 16 years, stay in use for six days a week and for 10 hours at a time. They need some particularly robust components, such as doors that can be opened and closed up to 200 times a day. By the year-end, Deutsche Post will decide whether to sell its vans on the open market. Analysts say Deutsche Post has shown the motor industry's shortcomings. "They have opened up a new segment, one which the conventional carmakers have not discovered because they are too hamstrung by their own processes," said Christoph Stuermer of PWC. Last month, Deutsche Post presented a new model, StreetScooter Work L, which has eight cubic meters (280 cubic feet) of space to carry as many as 150 parcels weighing a total of 1,000 kg (2,200 lbs.). The switch to electric motors makes the total cost of ownership no more expensive than for equivalent conventionally-powered vans, Gerdes said. For commercial reasons he wouldn't put a price on the Streetscooter, but said: "It did not cost billions to develop and produce. You will not believe how cheap it is to make."